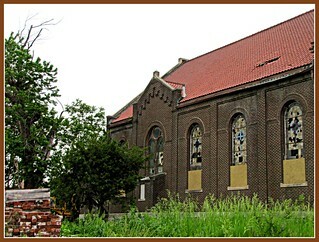 This Catholic church in Kansas City's sparsely population and largely forgotten east bottoms has been abandoned. A weak attempt was made to cover windows but the preservation team seemed to forget that rocks can be thrown. Unfortunately it only takes a kid or two and a handful of stones to destroy classic, beautiful stained glass windows.